Cervical nerve damage can occur due to injury, degenerative structural change and other possible causation. Nerve damage can affect the cervical spinal cord or the individual nerve roots that exit from the cord at each vertebral level. Damage to neurological tissues is often permanent, since nerves have limited ability to regenerate after suffering trauma, so the consequences of neurological injury may create chronic dysfunction. Nerve damage is a very real condition that can affect the sensory, motor and autonomic functionality of innervated regions of the anatomy. However, we also see nerve damage as being an excuse used by many doctors, particularly surgeons, to explain poor therapeutic outcomes. In these cases, there is often no evidence of nerve damage in the cervical spine and the diagnosis amounts to little more than limiting liability for a care provider’s dismal treatment results. This interesting essay explores neurological damage in the cervical spine. We will examine the various tissues that can be affected by a diversity of causative processes. We will also investigate subjective diagnoses of nerve damage that might not be valid conclusions. Trauma to the cervical spinal nerve roots can affect one or more of the nerves within the greater neck anatomy. Nerve root damage will cause symptoms to be produced at the site of innervation, which will range from nerve to nerve. Typically, the areas affected will include one or more of the following upper body regions: the neck, shoulders, upper arms, lower arms, hands or fingers. Symptoms might be unilateral or bilateral, depending on the type and extent of damage affecting the nerves. Trauma to the spinal cord is far more serious and might have much wider-ranging consequences. The cervical spinal cord is one of the most crucial areas of the central nervous system and the tissues contained therein basically innervate the motor, sensory and autonomic capabilities for much of the body from the affected level downward. Therefore, cervical spinal cord injury can affect many regions and bodily systems presenting unique expressions from patient to patient, depending on the tissue tracts that have been traumatized. As noted above, most nerve damage is considered permanent, as science still has not found a way to repair most cases of neurological trauma and the body will not normally be naturally capable of regenerating damaged nerve tissues either. 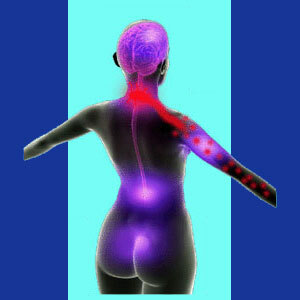 Spinal nerve and spinal cord damage can be caused by any form of trauma. Nerves can be crushed, compressed, severed, bruised or otherwise injured by many possible events, including falls, motor vehicle accidents, sporting accidents, acts of violence and other catastrophes. Spinal nerve and spinal cord damage can also occur due to particularly bad forms of degenerative change in the vertebral column, including central and foraminal spinal stenosis, cervical spondylolisthesis, severe changes in lordotic spinal curvature, severe cervical scoliosis and other possible processes. It should be noted that in virtually all cases, degeneration-induced nerve damage can be prevented, since it occurs slowly over time and the underlying causative issue can usually be treated in advance of suffering severe nerve trauma. Finally, disease processes can attack the nerves or spinal cord directly or affect structures that will subsequently traumatize the neurological tissues. Cancer, some autoimmune diseases, some neuromuscular diseases and other conditions can all cause lasting nerve damage in the neck region. Many patients run the gauntlet of neck pain treatment and endure terribly poor results. Many of these patients escalate their care path and eventually undergo unneeded and ineffective spinal surgery. Both conservative care providers and surgeons often use the excuse of nerve damage to justify disappointing therapeutic outcomes. However, we tend to hear this excuse offered by most often by surgeons, especially after multiple surgical undertaking fail to resolve the symptomology. In virtually every case, the opinion is rendered without any objective evidence of true neurological damage and is obviously a cop-out excuse given to cover up an overall horrific job of doctoring. If any doctor has told you that your treatment failed due to your having nerve damage, insist on getting a second opinion from an objective source. Any quality spinal neurologist will be able to perform testing to ascertain the viability of the tissues in the neck region, including the spinal nerves and spinal cord. We are thrilled to report that most patients who take our advice regarding this matter have found absolutely no damage having been incurred by their spinal nerves or spinal cord. Instead, they simply discovered what we warn about throughout our websites… They were misdiagnosed and their past treatment was never even necessary from day 1. Better to suffer this fate than to truly have cervical nerve damage, but maybe just by a narrow margin.